ODOT employee Shane McCoy, of Sidney, pumps fuel into his plow at the ODOT station next to Lehman Catholic High School Thursday, Jan. 17. McCoy will be driving the truck on Saturday when the area is scheduled for heavy snow. ODOT employee Rodney Ferguson, of Sidney, sprays off his plow at the ODOT station next to Lehman Catholic High School Thursday, Jan. 17. 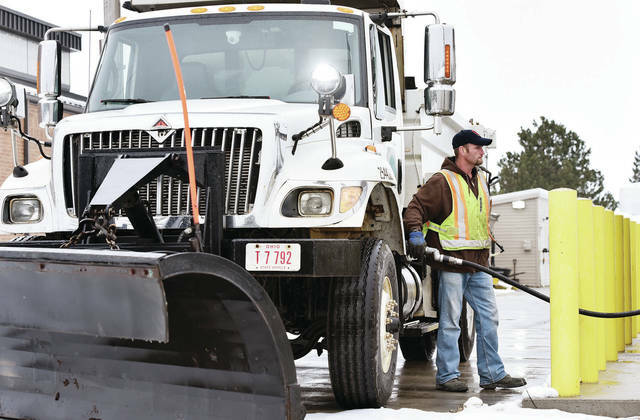 Ferguson will be driving the plow Saturday when heavy snow is forecast to fall in the area. SIDNEY — As a large winter storm makes its way toward the midwest, officials in Shelby County are bracing for the accompanying ice, snow, and wind. Harper, as the storm has been dubbed, is expected to have impacts across the country, from California to Maine, with heavy snow and accumulating sleet or ice expected in many locations. According to The Weather Channel, the exact placement of the storm’s heaviest snow is not definitive, but a path from the Ohio Valley into parts of New England seems likely to accumulate the most snow of any location east of the Rocky Mountains, with some areas in this swath estimated to pick up over a foot of snow. This snow, along with the likely chance of freezing rain and sleet, may all but guarantee the possibility of hazardous roads, bridges, and overpasses, leaving county and city workers alert. According to Shelby County Engineer Bob Guey, much of the county’s preparation for snow storms takes place before winter even arrives. “We do a lot of that planning back in the fall when we get the equipment ready,” Guey said. Just prior to the storms, the county engineer’s office prepares by rechecking equipment and fixing any issues that arise, as well as by communicating closely with townships and villages about plans of action. In total, Guey said, the county has 13 snow plows, as well as two additional back-ups, conducting 13 routes throughout Shelby County, covering 385 miles. “Right now, we’re getting everything in position and following that forecast closely,” Guey said of Harper’s impending arrival. Guey said pre-treatment of roadways could begin as much as 24-hours prior to the onset of a winter storm. Pre-treatment consists of the spreading of a liquid salt brine along with a product called Beet Heet, which is a solution made that, when mixed with the salt brine, works as a superior deicing agent, as opposed to salt brine alone. Beet Heet is made to mimic the deicing effects of beet juice, which has been used in recent years by cities and municipalities in the midwest and Canada for deicing purposes. This is due to its ability to lower the freezing temperature of water, which works to keep ice at bay, as well as keeping salt brine from clumping and freezing. The beet juice mixture is also less corrosive and gentler on vehicles, roads, and plants than salt brine alone. Beet Heet is a concentrated formula containing processed beet molasses, as opposed to pure beet juice. The product boasts a higher sugar content, which further suppresses the freezing point of salt brine while increasing the deicing ability. Along with pretreatment of roads, Guey said treatment can be applied during and after a winter storm to maintain safe travel. The City of Sidney Public Works Department is also busy prepping for Harper’s arrival. According to Director Gary Clough, the city has an arsenal of 22 trucks; eight large, six medium, and eight small trucks. The small trucks are used for clearing cul-de-sacs, the medium for hills and residential streets, and large trucks for main roads. Clough said a meeting was held Thursday afternoon to advise employees that they will need all hands on deck throughout the weekend. Clough said preparation of trucks is to begin Friday. Thanks to the city’s recently-constructed salt dome, which is two and a half times larger than the old dome, the worry of a potential salt shortage is a thing of the past. 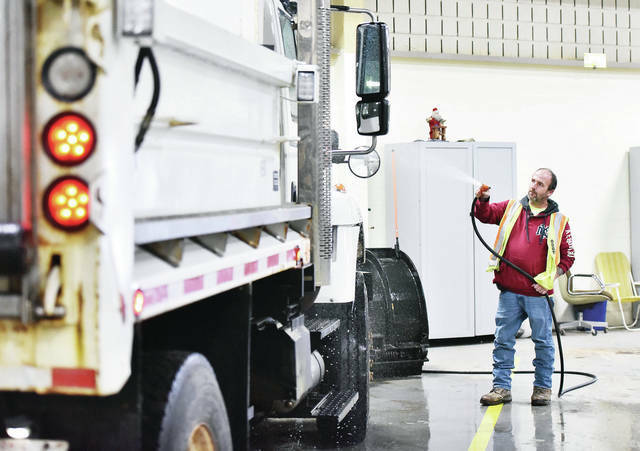 Mandi Dillon, public information officer for the Ohio Department of Transportation District 7, further emphasized the importance of pre-treatment when preparing for a winter storm. “With this storm, there’s a possibility of ice and that’s where pre-treat can really help because it prevents ice from sticking and helps it melt on contact,” Dillon said. ODOT also uses a pre-treatment comprised of a salt brine and Beet Heet mixture. Dillon said ODOT employees will be busy monitoring, pre-treating, readying trucks, and scheduling crews for weekend rounds up until Harper’s onset. She said crews are expecting to work 12-hour shifts. “The good thing with our crews is that they live here, and a lot of their friends and families live here, so they take a lot of pride in keeping the roads safe, not just for the traveling public, but for their own families,” Dillon said. As of 3 p.m., Thursday, the National Weather Service has issued a winter storm watch for Shelby County, and surrounding counties, to be in effect from late Friday night through late Saturday night. The watch indicates the possibility of heavy snowfall, with total snow accumulations estimated to be anywhere from six to 10 inches, with winds as high as 35 mph. A winter storm warning is also an indication that significant sleet or ice accumulations are possible. The National Weather Service recommends monitoring the latest forecasts and using caution when travelling on the roadways. To get the latest detailed forecast, visit https://forecast.weather.gov/MapClick.php?lat=40.2869&lon=-84.1542#.XEDpwdJKi00. Reach the writer at 937-538-4825.